Take a good look. This is the card that did it. 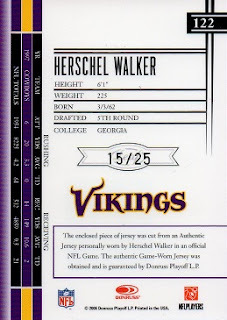 A 2006 Leaf Limited Threads Prime card, #122 of Herschel Walker, is the 600th different card in the Herschel Hoard. 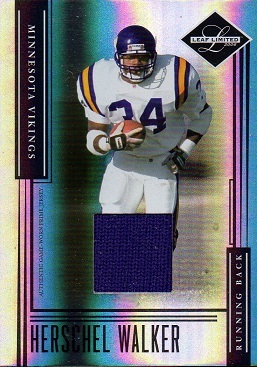 I had no idea what card would get the honor, as I just fill in the blanks in my collection as I find them. This is a game used jersey swatch card, from when Walker played with Minnesota. It's serial numbered to 25, with this being the 15th example. Now that I've reached the 600 level, does that mean I'll stop collecting Walker cards? Not at all. It just means the collecting process might get a bit slower. Just about every card I need at this point is a short printed, serial numbered version, or an officially issued, autographed version. Either way, these tend to be fairly pricey. Still, something I need comes along now and then at a reasonable price, and I'm still holding out hope that I can snag some cards on my most wanted list. Congratulations! Hitting a milestone like that is always fun. Congrats on hitting the milestone! Now to go for #700! Thank you, Anthony. I'll keep plugging away towards that #.